Mr. Cain was not a native of Cleveland Heights. He was born in Springfield, Ohio, on May 6, 1877. His family had a long history in Ohio. His father’s grandmother had lived in the second oldest house in Dayton. Both grandfathers had been in business for many years. Mr. Cain received his early education in Springfield. Then he came to Cleveland Heights in 1900. He found work in several firms until he settled with the Goff-Kirby Coal Company. Later he became and active partner in the Bailey Company, shippers of grain and feed. His business experience was of great value when he got into the government of Cleveland Heights. 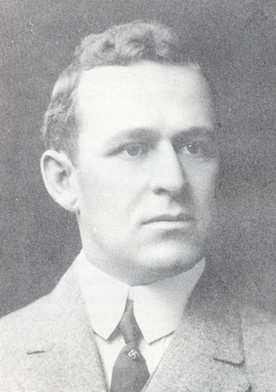 In 1910 he was elected a member of the Council of the village of Cleveland Heights. He is reported to have said that, at that time, there were more cows than people in the village. In 1914 he was persuaded to run for mayor of the village and was elected. The village grew and the demands of his position increased. He had less and less time for private affairs. He was re-elected time and time again. When his name appeared on the ballot, he was usually the top vote getter. In 1941 Mayor Cain received 81 percent of the vote. The citizens of Cleveland Heights had confidence in their mayor. He served 18 terms (36 years). What did the man do over the years to earn this respect and confidence? It would be hard to single out any improvement in Cleveland Heights during those thirty-six years in which Mayor Cain had no part. He really meant it when he said he had no political ambition. With the vote-getting ability he had, he could have reached the Ohio Legislature and probably the Governor’s mansion. But he wanted to make Cleveland Heights a residential area with improved transportation and utility services. These were his goals and he worked to achieve them. The first comprehensive zoning law in the state of Ohio. Acquisition of Forest Hills Park as a gift from John D. Rockefeller, Jr. Establishment of the suburb as the first of Ohio’s cities over 10,000 population to become debt free—with the lowest city-purpose tax rate in the county. It is no wonder that Mayor Cain served at the leader of the suburbs surrounding Cleveland when they needed to cooperate in any fight against measures that would limit their independence. Mayor Cain said his wife should have credit for a great share of his success. She ran the house and looked after their children, a son and two daughters, efficiently. She said that Frank ran the city as they ran their home. Mrs. Cain was interested in civic affairs and was a charter member of the Women’s Civic Club of Cleveland Heights.